So, I had totally intended to put this post up on Tuesday and do a different post today, but I just could not get myself to sit down and finish this post on Monday night. What I want to talk about in this post is personal, and it's something I didn't want to rush writing. Mondays are my off days. I don't have classes, I don't have to work, and I don't have plans unless they were previously made. I love my Mondays because they're basically a day to prepare me for my week. I was really looking forward to this Monday because I had a really busy week last week (surprise, surprise) and I was feeling stressed. I needed a day to just relax, and that was my plan for Monday. Until I woke up and checked my email. I check it every morning, and as I sit there watching the little refresh button turn and turn, I wonder if any responses from agents will show up. I've been waiting for a few months now to hear back from an agent who requested to see more of my manuscript, but I did not at all actually think I would get an email back from her any time soon. But, there it was. The email I had been waiting for since June. And it was another rejection. To be completely and totally honest, I was surprised. No, I'm not being vain or over-confident or anything like that. Honestly, I was just confident in my work and I sincerely thought she would want to see the rest of the manuscript. But, I was wrong. And not gonna lie, guys--it shook my confidence a little bit. This rejection then set the mood for my entire Monday. I didn't want to let it, but it did. I spent my morning shower (the time when I usually brainstorm and plot) questioning myself and my abilities as a writer. I kept getting my hopes up every time, only to be rejected over and over again. I went out that afternoon hoping that spending some time with my sister and friend would cheer me up, but when I arrived at my sister's apartment and sat down to relax with a cup of pumpkin spice coffee, I spilled it. All. over. myself. That was the icing on the cake. I was bummed, you guys. 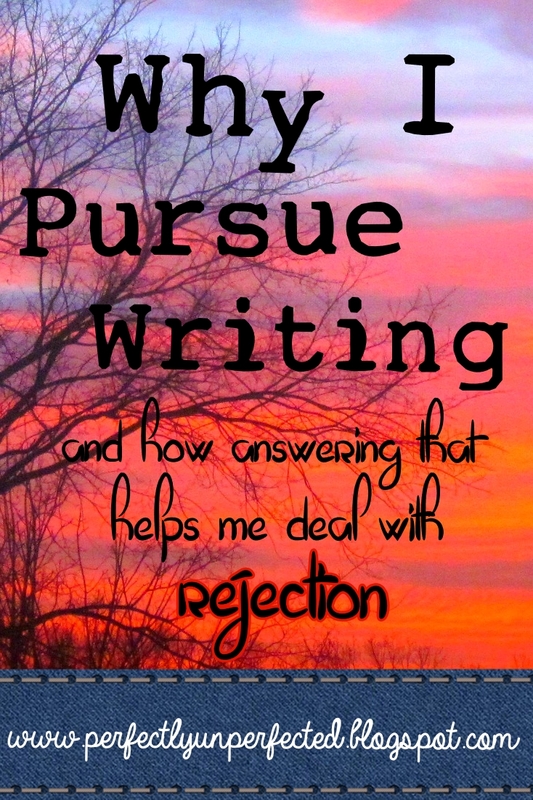 I was sick and tired of getting rejected and being afraid all the time. Will I ever get published? Is my work actually any good? Will an agent ever like it? My stress-free day was filled with more stress than I wanted to handle. But, as I went about my day, questioning myself and whether or not I'm actually supposed to be a writer, an idea popped into my head. So I wrote a list. 1. I can't stop. When I get an idea for a book, something inside of me stirs. I've been told I get this look of excitement and wonder in my eyes, and when I start writing, I can't stop. 2. I'm willing to take risks. Nothing is guaranteed, but I write anyway. I press on because it's my dream to see my book on store shelves someday. I won't stop until that happens. 3. I'm open to failure. Failure is a part of life. I have failed many times, and I will fail many more times. But with failure comes success. 4. It's my passion. There is nothing I love more than creating stories and characters that real people can relate to. Nothing can explain the feeling I get when someone tells me my words have moved them. 5. It's my purpose. God created me to write. I am a writer. It's a short list, I know. Just five, simple little things. But it made such a difference. When I write things down, they become real to me. So writing down these five things about myself made me feel a sense of strength. Yes, I've been rejected and yes I've failed, but that doesn't mean I'm giving up. I'm young. I have opportunities. I have time. 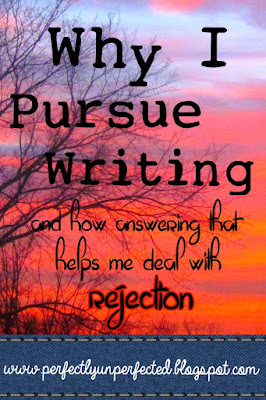 So if you ever find yourself down in the dumps on a suckish Monday or reeling after a rejection, make a list for yourself of reasons why you pursue writing. You just might be surprised by the results. So don't wallow in rejection, guys. Don't dwell in discouragement. May be you could enter this? My book is incomplete (so I can't enter) plus I'd be way to nervous and freaky-out about it and would drive everyone nuts. :) but there is no doubt in my mind that your book could win. Well clearly that agent was having an off day, too, otherwise he/she would have scooped you up. =) Great post! I just went through a similar experience and I think it actually helped my outlook on writing. I love your reasons for pursuing authorship. Especially #5. Keep up the awesome work! You can do it.